I love a homemade, authentic marinara, but sometimes I just want to get dinner on the table fast without sacrificing an ounce of flavor. 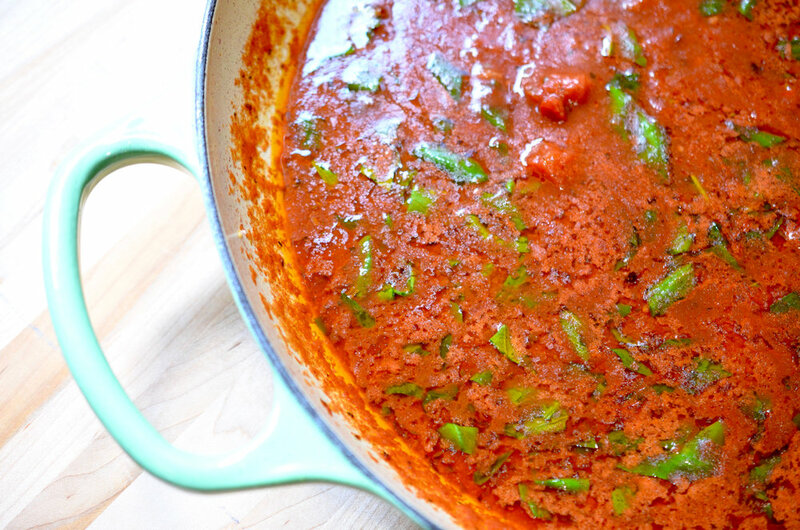 My version of an elevated store-bought pasta sauce is a fabulous (and quick!) way to add an extra kick to a jar of marinara. The best part is that you probably already have most of what you need in your pantry! Make sure you start with a good bottle of red wine – you can drink the rest with dinner! Tossing in some fresh basil at the end gives the sauce a burst of flavor (the heat hitting the basil opens up a whole new world of aromas) and adds a special touch that makes it look and taste like it has been slowly simmering away on the stove all afternoon! Watch my YouTube video: Store-Bought Marinara, Revamped! In a large sauté pan set over medium-low heat, add the olive oil. Once hot, add the garlic, red pepper flakes, salt and pepper. Cook for 30 seconds, making sure not to burn the garlic. Add the red wine and allow it to reduce by half, about 1-3 minutes, stirring occasionally. Next, add the marinara sauce and heat until just under the simmering point. Right before serving, stir in the butter and basil. Serve over your favorite pasta. Tip: If you want to be extra “naughty”, add a splash of heavy cream at the end to give this revamped sauce a slightly creamier texture. I’ve never known cream to make anything taste worse! Any French bistro worth its Fleur de Sel has a classic omelette on the menu, ready to be served at any time of the day or evening. A delicious canvas for all kinds of savory toppings, the French omelette is a simple and elegant option for breakfast during the week, for lunch, brunch, dinner, or a late-night kitchen rendezvous (with a glass of champagne!). No need to make a special grocery run, as even the most spare of kitchens is sure to have a couple of eggs and a few basic seasonings on hand to whip up this quick and easy meal. Don’t be nervous about presentation! With a little practice (and a few flicks of the wrist), you will be a pro in no time. Et Voilà, my Simple French Omelette! In a small bowl, beat the eggs, salt, and pepper until the yolks and whites are fully incorporated. Place a 10-inch non-stick frying pan over medium-high heat. Allow the pan to get very hot, but not smoking. Add the butter and swirl it around to evenly coat the bottom and sides of the pan. Once the butter is completely melted, the foam has subsided, pour the eggs into the center of the butter. Allow the eggs to sit for just a few seconds before you begin swirling the pan over the heat. Continue the swirling motion for roughly 20 to 25 seconds. Once the eggs begin to set and there is just a little bit of wetness in the center, jerk the pan several times back and forth in order to fold the eggs onto itself. The finished omelette will end up in the far lip of the pan. Grasp the handle of the pan from underneath and rest the far lip of the pan (where the omelette has formed) slightly off-center onto the bottom of a dinner plate. Gently turn the pan upside down over the plate. The omelette will then drop into position. There is something so incredibly chic about enjoying a breakfast or brunch dish at dinner time—especially when having company over! It takes people by surprise and with a sense of delight, transforming “just another dinner party” into a relaxed occasion. With the menu change there’s usually a palpable mood-change—guests let their guard down and the dinner party goes from regular, to memorable. The power of food always amazes me. My Eggs Provençal is just the dish to change up your dinner party dynamic. It is a flavorful combination of eggs, cream, cheese, and lots of fresh herbs. I love to serve it with an arugula salad tossed in my French Bistro Vinaigrette, Roasted Savory Carrots, a crusty store-bought Baguette, and a dry Champagne or Rosé. To enhance the chic-factor, I set my table with simple white plates, flatware, and linen napkins, scatter plenty of scentless white votive candles around the table, and use simple juice glasses filled with red or orange roses to add some drama! Best of all, this elegant dinner comes together in well under an hour. Happy cooking! In a large bowl crack the eggs and whisk vigorously until the whites and yolks are completely incorporated and the mixture is a pale yellow. Set aside. In a large sauté pan set over medium heat, heat the olive oil. Once hot add onions and season with 1 teaspoon of salt and 2 teaspoons of cracked black pepper. Sauté for 7 to 9 minutes or until translucent and slightly tender. Next, add the garlic and sauté for another 1 to 2 minutes. Reduce the heat to medium-low. Add the butter to the center of the pan and melt. Next, add the shredded mozzarella to the egg mixture, then add the rosemary, thyme, 1 teaspoon of salt, and 1 teaspoon of cracked black pepper. Whisk vigorously to thoroughly mix and immediately pour into the center of the sauté pan. Gently stir the eggs, constantly scraping the bottom and sides of the pan with a spatula. The mixture will slowly come together and begin to thicken. Remove from the heat after about 8 minutes, when the eggs are wet-looking and gooey, but no longer runny. Continue to gently stir off the heat for another minute. Next, transfer the eggs to the center of a serving platter. Garnish with arugula and big shavings of Parmigiano-Reggiano cheese. Inspiration for new recipes really can come from anywhere. A certain smell, a store window, a trip to a fabulous specialty foods store, and of course a restaurant! Last year when Linda and I were out to lunch, we both ordered a vegetarian burger filled with roasted beets and nutty farrow – it was so good! After a few tries, I came up with my Savory Beet & Farrow Cake – an elegant twist on the veggie burger we had at lunch. Instead of making individual patties, I decided to bake it in cake form, making it elegant enough to serve at a dinner party or cut up into small squares for a cocktail party. You can roast the vegetables and sauté the onion mixture up to three days ahead of time. You can store them together in an airtight container in the refrigerator. Then, on the day of your soirée, continue to follow the assembly and cooking directions - et voilà! Preheat the oven to 400 degrees F. Prepare a 9-inch round spring-form pan by buttering both the interior sides and bottom. Line the bottom with parchment paper, then butter the top of the parchment paper. Set aside. Place the sweet potatoes and beets onto a sheet pan. Toss with 2 tablespoons of olive oil, ¾ teaspoon of salt, and ½ teaspoon of pepper. Roast for 40 minutes, turning once half way through the roasting time. Remove from the oven and set aside. Meanwhile, in a small sauce pan, bring ½ cup water to a boil. Add the farrow, and cook for 18 to 20 minutes, or until tender. The farrow will still have a bite to it. Drain well and set aside. In a medium sauté pan set over medium heat, add 1 tablespoon of olive oil and 1 tablespoon of butter. Once heated, add the onions and ¼ teaspoon of both salt and pepper. Cook until tender and translucent, stirring occasionally. Next, add the garlic, nutmeg, and sage, and continue to cook for an additional 2 minutes. Transfer to a large bowl. Add the roasted vegetables and cooked farrow and set aside. In a small bowl, beat the eggs and half and half. Then add both cheeses. Pour the egg mixture over the vegetable mixture and add the panko. Gently stir to mix completely. Transfer the mixture into the prepared spring form pan. Bake for 25 to 27 minutes, or until set. Remove the pan from the oven and allow to cool for 5 minutes before serving. This year, Ryan and I are spending my birthday and Thanksgiving in Chicago and will be taking full advantage of our festive city leading up to the big feast! On my birthday we have dinner plans at my favorite restaurant RL, then will walk over to The Peninsula Chicago to enjoy a cocktail and ice skating atop their Sky Rink—what a fabulous birthday! On Thanksgiving Day, our menu will consist of things that are store-bought, a few recipes that can be made in advance, and the main course—Gruyere Cheese Soufflé—that will be made right before serving (Julia Child, thank you!). In addition to making some of the recipes in the days leading up to Thanksgiving, I will also set the table in a palette of white, grey, and pumpkin colored plates, bowls, linens, and white un-scented candles. Simple white roses, fresh herbs, and silver dollar eucalyptus arranged in silver bowls will take center stage! Last year, my friend and watercolor artist Linda Marie Clark and I launched Watermarc – Art & Appetite, a growing line of vibrant and collectible occasion cards that are created around collections of my original vegetarian recipes and Linda’s whimsical watercolors. We developed a series of cards titled “An Autumnal Feast” which had some of the most flavorful Fall recipes you could dream of! That series has since been retired and I have wanted to share my recipes and Linda’s artwork that were a part of the original collection as they are just too delicious and colorful to keep locked up. These are some of my favorite recipes I have created as they’re classic delicious twists that really bring home the Autumnal flavors. Whether you are looking to spice up your holiday menus, inject some variety for a weeknight/end dinner party, or completely revamp what you normally serve, I know these recipes will add the “Wow!” factor, up the flavor factor, and will have your guests asking for more! From our home to yours, Ryan and I wish you the most glorious Thanksgiving filled with good food, good wine, and the most important ingredients: Big pinches of love and appreciation! I love recipes that you can make in advance of entertaining that actually taste even better after it sits for a couple of days in the refrigerator and the flavors all blend together! My Vegetarian Chili - dubbed “I Get a Kick Out of You Chili - is from my cookbook Entertaining with Love and is a perfect example of just that. This hearty chili is packed with fresh vegetables, black beans, and meatless ground, making it as substantial as a traditional chili made with ground beef. You can either make this dish entirely on the stovetop, or partly in a slow cooker, whichever method you decide the end result is the same – fabulously delicious! Best of all, you can top this chili with sour cream, fresh parsley, tortilla chips, avocado wedges, or even charred fresh jalapeños, allowing your guests to be creative and make it their own! This recipe is from my cookbook Entertaining with Love. In a Dutch oven or stock pot, over medium-high heat, melt the butter. Once hot, add the diced onions and sauté for 3 minutes. Season with ½ teaspoon of salt, 1 teaspoon of black pepper, and crushed red pepper flakes. Then, add the bell peppers and continue to sauté for another 5 minutes. Next, add the garlic and sauté for 2 minutes. Add the beef grounds and stir to combine. Reduce the heat to medium-low. Cook for 5 minutes. In a small glass bowl combine all of the remaining spices: Chili Powder, Cumin, Cayenne Pepper, Hot Paprika, 1 teaspoon of salt, and 2 teaspoons of black pepper. Thoroughly drain the black beans and add to the onions and peppers. Add the can of crushed fire-roasted tomatoes. Stir all together. Bring to a gentle simmer, and then reduce the heat to low. Add the combined spices and the tomato paste. Stir to mix thoroughly. Place the lid on the Dutch oven and reduce the heat to simmer/low. At this point you can transfer the contents to a slow cooker and set to low heat. On the stove, keep covered and cook for 1 hour, stirring occasionally. In the slow cooker set to low heat cook for 3 hours. There is nothing I find more satisfying than a big bowl of warm soup this time of year! My Carrot, Leek, & Potato Soup is filled with fresh vegetables that are cooked until just tender, then puréed into a thick and luscious soup that is perfect for a cool evening dining al fresco, a casual supper, or a weekend lunch. In fact, this soup is so hearty that all you need to serve alongside it is a basket a crusty French bread, a green salad, and a bold red wine—the ultimate in casual yet chic comfort food! Best of all, you can store containers filled with this fabulous soup in the freezer for those extra-chilly nights when only a bowl of piping hot stick-to-your-ribs kind of soup will do! In a large heavy bottomed pan or stockpot set over medium heat, add the butter. Once the butter is hot, add the leeks, as well as both yellow and red onions, red peppers, garlic, parsley and thyme. Cover and cook for 12-14 minutes, stirring occasionally. Next, add the vegetable stock, salt, pepper, potatoes, and carrots. Bring to a boil, then lower the heat and simmer covered for 20 minutes, or until the potatoes and carrots are tender. Working in small batches, transfer the soup into the bowl of a food processor fitted with a steel blade, and process until coarsely puréed. Return the puréed soup back into the pot. Whisk in the half and half and re-heat over medium heat until hot. Ladle into individual serving bowls and garnish with fresh parsley and freshly grated Parmigiano-Reggiano cheese. One of the best and most versatile recipes a savvy home cook should have in their repertoire is a simple pastry dough recipe. Well, are you in for a treat! One of the components for my Savory French Tart happens to be a buttery pastry crust made with a recipe that does not require any specialty equipment, ingredients, or large amounts of time. The dough can be transformed into either a sweet or savory base by just adding or subtracting ingredients like white pepper, rosemary, sugar, and other fresh herbs and spices. You can then use the dough for tarts, pies, quiches, and crostatas. With the holiday season fast approaching I am always thinking of recipes that I can make in advance, have multiple uses, and serve to my guests in a few different settings. My Savory French Tart fits the bill! I can make it ahead of time and serve it with a simple salad and a bowl of White Bean Soup with Fresh Parsley Pesto for a dinner party, I can serve it at cocktail hour for an hors d’oeuvre, or even as part of a buffet, the list goes on and on! Happy entertaining! Place the flour, salt, white pepper, sugar, and fresh rosemary into a medium sized bowl. Whisk to mix ingredients. Next add the butter. Use a pastry blender to quickly break the butter into pea-sized pieces. Add the ice water and with your hand slightly cupped quickly work the water into the flour. Lightly flour you work surface (a granite or marble countertop is ideal as it keeps the dough very cold). Press the dough into a roughly shaped ball. Using the heel of one hand and rapidly press the dough in small amounts onto the board and away from you. Repeat this process two times. Doing so will ensure that the butter has been completely blended. Gather the dough into a smooth ball, dust lightly with flour, and wrap it in waxed paper. Butter an 11½ inch tart pan. Remove the dough from the refrigerator and place it onto a lightly floured work surface. Quickly roll out the dough to be slightly larger than your pan and to be about ⅛-inch thick, making sure to lift and turn the dough during the rolling process to prevent it from sticking. Fold the rolled piece of dough into quarters and gently place it in ¼ or the prepared tart pan. Unfold the dough inside the tart pan. Gently press the dough onto the bottom of the tart pan. Then lift the edges of the dough from underneath and work it around the sides of the tart pan. Trim off the excess dough by rolling your pin over the top of the pan. Prick the bottom of the dough all over several times with the tines of a small fork. Line the dough with parchment paper and fill it to the top with dried beans or pie weights. Place the tart pan onto a sheet pan and bake for 20 minutes. Carefully remove the parchment paper and beans, prick the bottom of the dough again with a small fork, and bake for an additional 15 minutes. Set aside. Leave the tart pan on the sheet pan. In a large sauté pan set over medium heat, add the butter and olive oil. Add the onions, salt, pepper, and sugar. Cook for 20-30 minutes, stirring occasionally until the onions are very tender and caramelized. Add the garlic and continue cooking for another 1 to 2 minutes, making sure the garlic does not burn. Spread the onions in an even layer on the bottom on the partially baked tart shell. Whisk the eggs, heavy cream, salt, pepper, and nutmeg in a small bowl. Pour the mixture slowly into the tart shell over the onions. Bake for 30 to 35 minutes, or until the top of the tart is slightly puffed and golden. Allow to cool for 20 minutes, then unmold the tart from the pan. Optional Garnish: Before baking, dot the top with goat cheese and ⅛-inch thick sliced rounds of peeled red onion. Bake as directed. Tip: Finished tart can be refrigerated for up to 2 days. Allow to sit at room temperature for 1 hour before serving. Idea: You can make the dough 2 days ahead of time. Remove the dough from the refrigerator and allow it to sit at room temperature for 15 minutes. Follow all preparation and baking instructions as written.